Whatsapp new features and new updates always remain on trend. As you all know WhatsApp is the most popular messaging app in the world and it is currently used by 1.2 billion people. As you all know WhatsApp status is a feature of WhatsApp new version which is aping of snapchat, but there are many other small WhatsApp new features came in 2017. 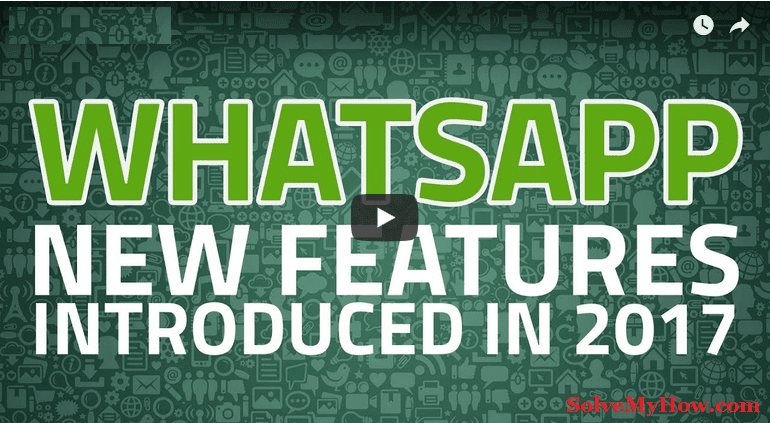 We will see the entire WhatsApp new features 2017 list here. In October 2017, WhatsApp officially made the delete for everyone feature live for all the users. This was the most needed feature in WhatsApp after the blue ticks feature. As per the name, Now sender can delete the sent message to an individual or from group as well. So now sender can delete the text message, images, videos, file etc. After the action, the message will be deleted from user and sender side as well with the message “this message was deleted”. A status feature of WhatsApp was one of the most important updates of this year. Whatsapp status feature was rolled out to users globally in February 2017. Now users can upload their images and short videos in WhatsApp status. Which will be automatically removed after 24 hours. Whatsapp added an extra security layer by giving two-step verification as WhatsApp new feature. With this feature, users will be able to verify their number. When they install the WhatsApp app on the new device more securely. Users will have to provide 6 digit password which they set up while enabling two-step verification in WhatsApp. Watch this video to enable or disable two-step verification on WhatsApp. As you all know WhatsApp is the most important app when it comes to media sharing…! People often handout take photos, selfies, videos etc. So it was quite a hectic task to send only 10 media files at a time. This was the previous Whatsapp media sharing limit. Thanks to WhatsApp now it is increased to 30. These days WhatsApp is testing one more feature called In-app youtube playback. This is really a great feature. This allows watching the youtube video on the WhatsApp app. That’s great right? It means you don’t have to leave the app. You can watch the video there only. This feature is currently available in iPhone 6 and later models. Whatapp is testing one amazing feature on windows phone and windows 10 mobile platform. So if you change your mobile number. This feature will notify your contacts that you had to change your number. Whatapp is reportedly working to introduce group voice and video calls on the chat platforms. Whatsapp finally launched “Live Sharing Location” feature. So now 1 billion people can share their live location with their friends and family. This is indeed one of the most useful WhatsApp new features. The user can share the live location for maximum 8 hours. A new option in...Account privacy settings will give you an overview of all WhatsApp chats you are sharing your live location with at a time. Verified accounts feature is specifically launched for business. So it can become the lot easier to identify the brands or companies and one can reach out to them easily. These companies will have the green badge with which tick mark next to their names. The chats will be denoted with the yellow messages and one will now be able to delete their messages. Whatsapp is slowly rolling out an update to transfer all types of files on WhatsApp. With this new feature of WhatsApp you’ll be able to send the video in a wide variety of formats, mp3 songs or even APK files for that matter on Whatsapp. So these were the features of WhatsApp new version. So this was all about Whatsapp New Features - The Complete List. I hope you enjoyed reading this article. Did I miss any important/WhatsApp new features? Do let me know in the comments below. I would love to add news WhatsApp features in the post. I would be really glad if you can share this post with your social media friends on Facebook, Google plus and Twitter. You can use social media buttons on your left for quick sharing. You can also subscribe to the SolveMyHow newsletter to get latest updates about new WhatsApp features 2017 and other trending things right in your inbox!